Alicante, Benidorm, Albir, Denia - you name it and you’ll probably find some of Spain’s most loved holiday destinations in the Costa Blanca. This heavenly hub of sprawling sandy beaches, turquoise coast and cosy restaurants really does have it all. Whether you’re looking for a romantic break for two, a wild holiday with friends, or some chilled time out with the family, the Costa Blanca is variety wrapped up in beach holiday bliss. Best of all, all of the Costa Blanca hotels and top attractions are within a short drive of one another. So why limit yourself to just one holiday hotspot when you can enjoy them all? This is the beauty of the Costa Brava, you have the best of Spain all in one irresistible holiday paradise. As soon as you land in the Costa Blanca, you’ll no doubt find yourself drawn to the sea. Lapping the gorgeous south-eastern coast of Spain, the Balearic Sea effortlessly remains a top attraction. Seek out the perfect sandy spot to lay down a towel and catch the warming rays you’ve been longing for, followed by a cooling dip in the sea. Sound dreamy? Welcome to a Costa Blanca holiday! If you’re treating the kids to a sunny getaway, there are plenty of attractions and activities to make sure they have the time of their lives. Look no further than the beach for thrilling water sports and snorkelling, or if you can prize yourselves away from the shore you’ll find wild water parks and rides further inland. Rumbling tummies needn’t last too long with an impressive array of restaurants along the coast offering al fresco dining met with stunning views of the Costa Blanca’s best bits. If it’s an authentic taste of Spain that takes your fancy, the old towns of Benidorm and Valencia will delight with rich, flavoursome sauces complementing tender meats and fresh seafood. Of course, if you prefer the comforts of home you’ll find it easy to spot restaurants serving the classic dishes we know and love, while our Costa Blanca hotels are fuss-free and friendly. The Costa Blanca is situated on Spain’s south east coast and covers over 200km of the country’s top resorts including Alicante, Benidorm and Torrevieja. 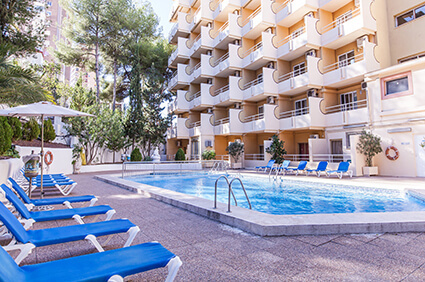 With Alicante airport situated right in the middle of the Costa Blanca, most resorts are around a 40-minute drive away. The easiest way to explore the Costa Blanca is by hire car, however train and bus routes run regularly between the main resorts. Most hotels will be able to provide a timetable and suggested routes. This 7km stretch of Blue Flag bliss sees holidaymakers returning day after day, and in fact year after year. You’ll find this easy to access beach is ideal for all, with fun activities such as beach volleyball on offer, plus an impressive promenade lined with shops, bars and restaurants. San Juan de Alicante has it all, there’s even a mini-golf course nearby too! Benidorm’s main stretch of beach is an ideal bay for making the absolute most of Spain’s White Coast. With shallow, rippling waves and lifeguards present throughout the day, Playa de Levante was made for families. Stroll along the promenade and take in the views, or grab a sun lounger and make the most of the gorgeous summer sunshine. The choice is yours! If the lively shores of Alicante and Benidorm are a little too busy for your liking, a tad further along the coast lies Cala Finestrat. Much smaller in size, this friendly bay boasts soft sand and blue waters along with a handful of good restaurants and shops nearby. You’ll also find an arts and crafts market here along the seafront so keep your eyes peeled for some great souvenirs to take home with you. Still within easy reach of Benidorm, Cala Finestrat is the ideal place to visit for a spot of peace and quiet. Low Festival has been running for over seven years, and is Benidorm’s biggest festival. It runs in late July, and there’s always a great line up. Previous acts have included Franz Ferdinand, Belle and Sebastian, The Kooks, and lots of local Spansih DJs. There’s great food, a huge pool, and enough room to relax and enjoy the music. If you fancy a change from the Costa Blanca’s beaches, Algar Waterfalls are the perfect alternative. Just a 30-minute drive from Benidorm, this natural wonder treats the eye with beautiful flowing waterfalls, enticingly clear pools and colourful flora throughout. Don’t forget to pack your swimming gear and towel as visitors are welcome to take a dip in the naturally formed pools that are simply impossible to resist. Comprised of four zones designed to fully immerse visitors in the animals’ natural habitats, a visit to Terra Natura is a unique experience for all ages. From the exotic landscapes of Asia including elephants, tigers and rhinos to the colourful birds and playful monkeys of America, witnessing these incredible species in a spacious and natural environment makes this zoo a must visit. Terra Natura is both educational and awe-inspiring - a great day out for anyone and everyone. Offering three different levels of thrill; infantile, moderate and radical, Aqualandia water park in Benidorm boasts plenty of rides to keep everyone happy - no matter how daring (or not). Gently bob around the Amazon lazy river, splash the little ones in the Laguna pool or whizz your way down spiralling slides - Aqualandia offers wet and wild fun for all of the family. Located right by the coast of Benidorm, this holiday hotspot may even be within walking distance for some! In recent years, Benidorm has become known for its lively beach-front being a particular favourite with British tourists. However, Benidorm has also maintained much of its old-world charm in the old town. A maze of cobbled alleys, wonky villas and archaic churches, the old town encompasses the very best of traditional Spain. Head to the renowned ‘Tapas Alley’ for the best bites of the delicious dishes that have made Spanish cuisine so popular worldwide.